History unfolded before my eyes yesterday morning. Never in millions of years I would have thought of assisting to such an important event in my life. Pope Benedict XVI left his Papacy for good after announcing his resignation fifteen days ago. It was shocking news, no other Popes after Pope Celestine the 5th had ever resigned since that year in 1250. Strangely has it seems, the Vatican was not ready to keep a Pope in retirement needing new staying accommodations, medical assistance, a new set of clothes, furniture and servants. Usually Popes don’t resign, they die and go down in history, that’s how they mark the end of their duty towards the Church. Now seamstresses are working on his new dresses, he will wear the white “zimarra” without the cape, new shoes of different colors are in the making and the new apartment in the Vatican’s nunnery convent is the remodeling phase, where he will spend the rest of his life in seclusion. The Pope left us all puzzled and in doubt that there is more to this story than his frail health and advancing age. The Pope’s high power CEOs and media have said the Pope is not sick, just very fatigued. Today’s resignation created a huge precedence setting new rules in the Vatican. This could mean that in the future, a Pope might resign anytime he feels like, if for whatever reason gets tired of this highly important job, or the pressure of carrying-on duty and responsibility towards the followers becomes too heavy. He can tell the world “I have had enough of you now, good-bye, I go shrivel up in my little corner”. Furthermore, it means that any corporation or high power government can order the next Pope to step down at anytime, using the excuse of a bad health as a cover-up. This gesture of resigning was wrong, it has undermined the Catholic Church and diminished the role of the Pope in the service of the Christian community. How two Popes are going to exist until Pope Emeritus Benedict XVI will be alive? This was not an act of courage, it was simply wrong. Perhaps 100 years from now, posterity will know the real reason that forced him to resign. For the moment, we cannot help feeling abandoned. The ceremony of the Pope’s transfer to Castel Gandolfo by helicopter was solemn and emotional. Castel Gandolfo is a beautiful large mansion built around the 17th Century owned by the Gandolfo’s family and later expropriated by the Vatican, as the Gandolfo’s could not pay their high debts towards the Vatican. The house faces the Lake Alban and sits on the Alban hills of the Roman countryside. Ever since it became the Pope’s vacation residence, the Swiss Guards guarded the house and the main door always kept open. 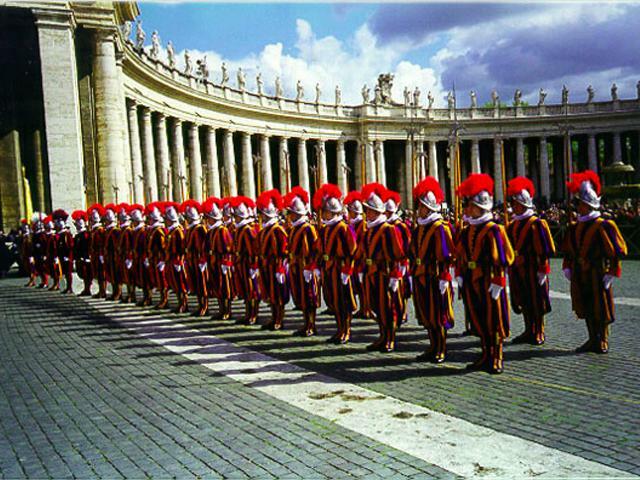 Since 1506 the Swiss Guards have been in service of the Pope only, no other person or office in the State of the Vatican. Their colorful uniform made of tri-color combination orange, blue and red, conceals highly trained snipers and combat soldiers. Yesterday in their formal uniforms their duty was over. At 8:00 pm sharp the Swiss Guards closed Castel Gandolfo’s doors as a symbol that the Papacy is empty and their duty is over. 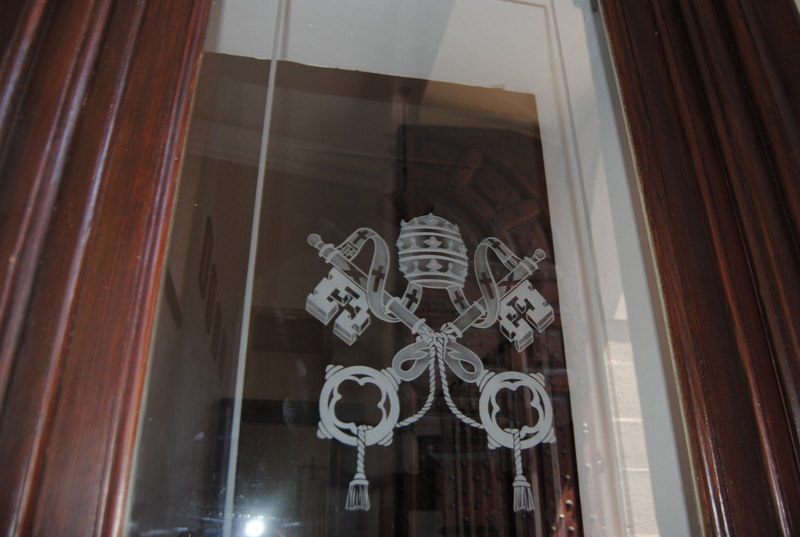 The Vatican’s Gendarmerie took over Castel Gandolfo’s security. 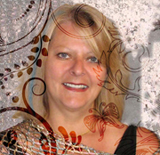 This ceremony, unique in its genre, had never happened before. 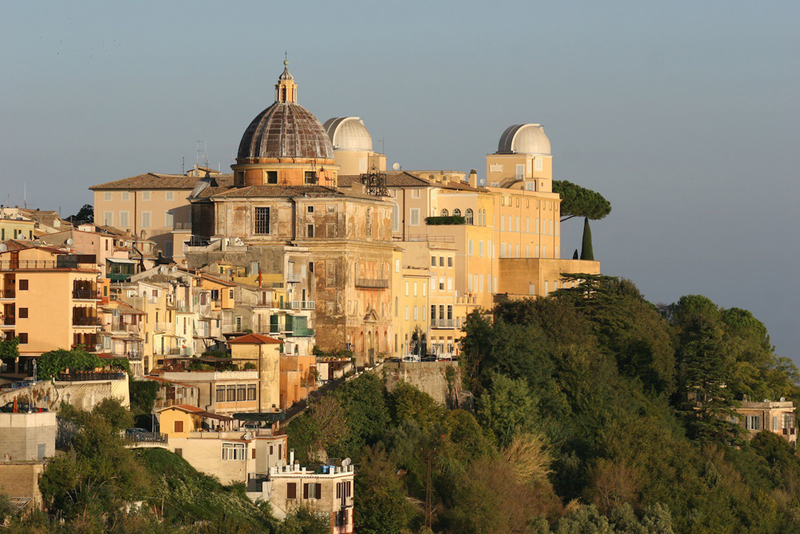 Castel Gandolfo did not even exist in the year 1250 when Pope Celestine the 5th resigned and neither did T.V. to project these historic images in the world. I really witnessed history in the making! 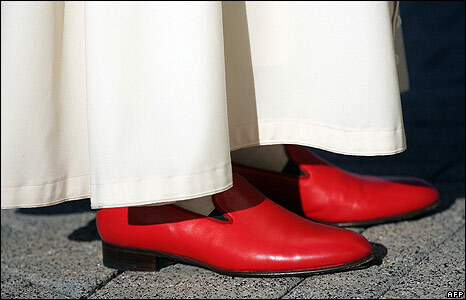 Pope Emeritus Benedict XVI, as he will be called from today, will no longer wear the famous red loafer, reserved only for the reigning Pope. 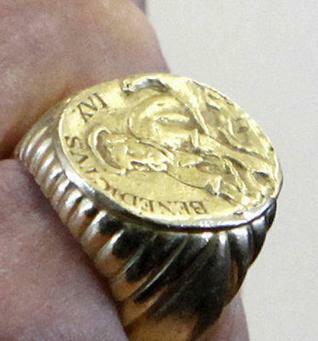 His gold ring, the “Ring of the Fisherman”, decorated with a depiction of St. Peter in a boat casting his net, with the name of the reigning Pope around it and made only for him will no longer be in use. The goldsmith will create a new ring for the next Pope with a new seal.